I thoroughly enjoyed the previous book about the young autistic girl Lauren, Slug Days, and was excited to have her story continue. Here, she and her family are driving out to North Dakota for her aunt's wedding. Lauren is going to be a flower girl at the wedding. The long car ride is only one of the challenges that Lauren faces here. She has to get used to some new people, including her Uncle Raymond, who can speak cow, her Almost-Uncle Charlie, and three cousins: Kevin, Zoe, and Sophia. 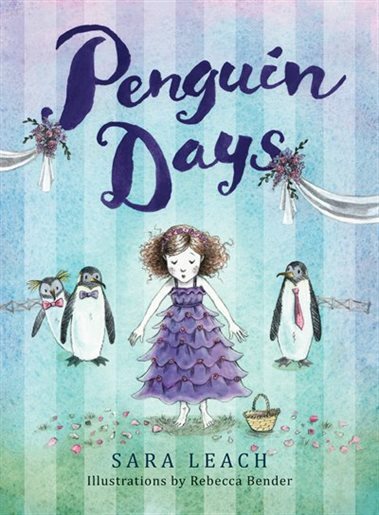 She and her cousins have to wear new clothes, and it is the "penguin suit" that Kevin complains about wearing that inspires the book title as well as some action in the book. Lauren doesn't like scratchy clothes and her imagination takes her in an unusual and fun direction for alternatives. It's neat to watch Lauren develop here, and conquer new situations, and make new friends. The illustrations are charming, and really bring the story to life. From penguins to cows, scratchy dresses to pug onesies, they added to the story. I particularly liked the photo style pictures at the end. I hope to see more Lauren books.